The first time was 2013 and the event organiser, Roger Woodall personally vetted TRU as a media partner and took the time to meet with the coach of a team being sponsored by TRU. The star of that RedPanda7s team was one Mike Haley, who made his England Saxons debut last weekend. 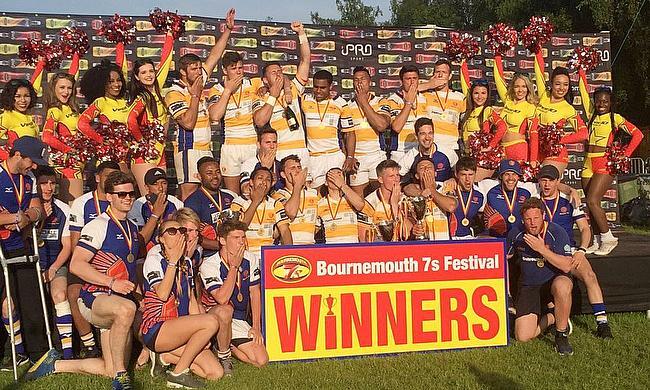 Mike was back supporting TRU at the Bournemouth7s in 2015. The 7s event has an elite competition of 16 teams sponsored by Viper10s; there are 4 groups of four on the Saturday. Surprisingly, given the quality of the teams, the costs involved for players, teams and sponsors only 3 per pool go through to the Sunday finals. The top two of each pool making it to the finals and the third to a Plate Competition. The quality of the pool matches was excellent. In the second game RedPanda faced Forces Exiles. Kick off 10.20am. At 10.22am RedPanda took the lead through scrum half George Frury; in scoring the true dislocated his shoulder. There was a lengthy delay and medical treatment was slow to arrive but when it did, it was a credit to Roger and his team. George was taken by para-medics to the first aid facility, manned by para-medics and St Johns. At 11.20am, George was being transferred to an Emergency Ambulance; having received first class attention, some oxygen and morphine. Expecting to head to Bournemouth A&E, the para-medics told RedPanda team management PooleA&E would be better as there was an Orthopaedic Surgeon on Duty. At 1.22pm Georgewas back at Bournemouth7s - two X-Rays, shoulder put back, letter for George'slocal hospital in Reading. Seriously impressive. Back on the pitch RedPanda took the game. There next game was against tournament favourites the Viper10 AllStars. The northern based RedPanda coming out on top and taking a 3 from 3 to top their pool. The likes of Tom Varndell and Callum Sheedy mingled with the crowds and RedPanda players. The atmosphere was building and the level of spectator engagement growing. Rugby 7s on the main pitch was the hero. Apache and St Paul's played out a very close pool game, with Apache taking the spoils. Apache had a well drilled game plan and look to have great team cohesion from the start. Bryanston Old Boysfeatured Bath University alumni, Freddie Strange, Alex Brown and Ben Loosmore. They play a very entertaining brand of 7s and Freddie Strange conducts this rugby orchestra with aplomb. In other games the J9 Bears and the Army played high paced 7s on the opening day and caught the attention of the crowds. The crowds continued to grow and there was a sense that this was Rugby 7s being showcased. The elite standard was in parts as proficient as the WorldRugby 7s series; these were not weekend warriors as the RFU seem to want to portray 7s festivals around the country. Elite7s coaches such as Paul Treu, Mike Friday andBen Ryan would have found the standard impressive and could have used it for talent ID. Leaving the event on the Saturday evening, we passed by the netball and hockey events that help make up the multi sport festival but it was clear this was a 7s spectacle. The finals looked likely to be played in sunny hot conditions and the crowds were eager to get the running order. St.Pauls Pirates tweeted they had to thank their white van sponsors for the overnight car park accommodation - their first up performance against RedPanda seemed to indicate the accommodation had worked perfectly. St Paul's Pirates could put a foot wrong, they kept possession answered clinical with every opportunity. It was RedPanda who had slept badly, with mistakes and at one point down to 5 men with two yellow cards. A great win for the White van men and time for the infamous RedPanda court session!